William Horsley was the son of John Horsley and Elizabeth Ames. William Horsley died before 1911 at at the age of 14. Peter Horsley was the son of John Horsley and Elizabeth Ames. Peter Horsley died before 1911 at at the age of 2. Albert J. Heileman married Louise Margaret Reding. Albert J. Heileman was born circa 1890 at Wisconsin. Married Name Her married name was Heileman. Louise Margaret Reding married Albert J. Heileman. Louise Margaret Reding was born on 10 May 1892 at Grant, Wisconsin. 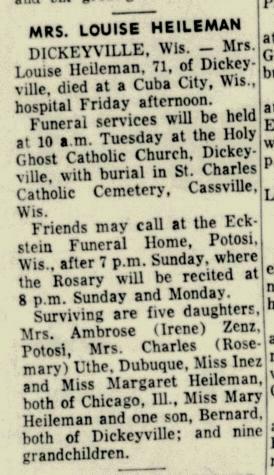 She died on 10 April 1964 at Grant, Wisconsin, at age 71 Louise (Reding) Heileman obituary. Married Name Her married name was Zenz. Irene Heileman married Ambrose Zenz, son of Wilhelm Zeng and Anna Degenhardt. Irene Heileman was born on 12 March 1916 at Wisconsin. She was the daughter of Albert J. Heileman and Louise Margaret Reding. Irene Heileman died in February 1975 at age 58. Name Variation Ambrose Zenz was also known as Zeng. Ambrose Zenz was the son of Wilhelm Zeng and Anna Degenhardt. Ambrose Zenz married Irene Heileman, daughter of Albert J. Heileman and Louise Margaret Reding. Inez Adell Heileman was born on 2 April 1919 at Cassville, Grant, Wisconsin. Inez Adell Heileman died on 12 April 1996 at age 77. Margaret Heileman was born circa 1922 at Wisconsin. Mary Heileman was born circa 1936 at Wisconsin. Bernard A. Heileman married Anita Timmerman, daughter of Delvan Matthias Timmerman and Irene C. Wiederholt. Bernard A. Heileman was born on 26 January 1932 at Wisconsin. He was the son of Albert J. Heileman and Louise Margaret Reding. August Muller married Kate (?). August Muller was born circa 1862 at Wisconsin. Kate (?) married August Muller. Kate (?) was born circa 1870 at Wisconsin. 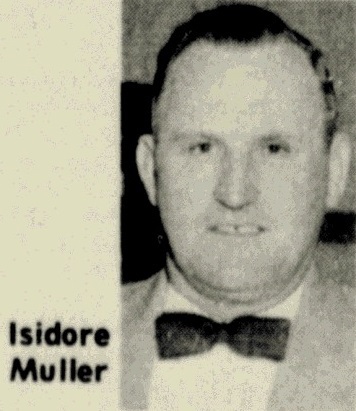 Nickname Isidore Muller also went by the name of Izzy. Isidore Muller married Genevieve Kirchberg, daughter of Charles Kirchberg and Lucy Alt. Isidore Muller was born on 8 May 1909 at Tennyson, Grant, Wisconsin. He was the son of August Muller and Kate (?). Isidore Muller died in June 1974 at Dubuque, Iowa, at age 65 Isidore Muller obituary. Genevieve Kirchberg married Isidore Muller, son of August Muller and Kate (?). Genevieve Kirchberg was born circa 1913 at Wisconsin. She was the daughter of Charles Kirchberg and Lucy Alt. Harvey Muller was the son of Isidore Muller and Genevieve Kirchberg. Reverand Garland Muller was born circa 1907 at Wisconsin. Dorothy Marie Pluemer and Vernon Francis Richard were married by Reverand Garland Muller in June 1944 at Tennyson, Grant, Wisconsin; Dorothy Marie Pluemer and Vernon Francis Richard marriage announcement. Name Variation Charles Thomas Muller was also known as Charley. Charles Thomas Muller married Mary Agnes Pluemer, daughter of John Joseph Pluemer and Margaretha Gertrude Reuter. Charles Thomas Muller was born on 16 August 1894 at Wisconsin. Charles Thomas Muller died on 6 January 1975 at Grant, Wisconsin, at age 80. Carl Muller was born circa 1912 at Wisconsin. Robert Muller was born circa 1902 at Wisconsin. Robert Muller died between 1920 and 1974. Alfred A. Muller married Stella Pluemer, daughter of John Joseph Pluemer and Margaretha Gertrude Reuter. Alfred A. Muller was born on 24 November 1899 at Wisconsin. Alfred A. Muller died on 13 September 1951 at Wisconsin at age 51. Lenora Muller was born circa 1891 at Wisconsin. Lenora Muller died between 1920 and 1974. John DeMuth married Hildagarde Hinderman, daughter of Valentine Hinderman and Magdalena Thor. Name Variation John David Meehan was also known as David. Name Variation John David Meehan was also known as Dave. John David Meehan married Regina Hinderman, daughter of Valentine Hinderman and Magdalena Thor, in February 1935. Frank Thor was the son of (?) Thor. Name Variation August Thor was also known as Gus. August Thor was born in 1884. He was the son of (?) Thor. August Thor married Mary Droessler, daughter of Joseph Droessler and Caroline Wiederholt, before 1914. August Thor married Hilda (?) after 1919. August Thor died on 25 August 1972 at Wisconsin. He was buried after 25 August 1972 at Immaculate Conception Church Cemetery, Kieler, Grant, Wisconsin. Ray Morgan married Bertha Hinderman, daughter of Valentine Hinderman and Magdalena Thor. Married Name Her married name was Hinderman. Clara (?) married Michael Hinderman, son of Valentine Hinderman and Magdalena Thor. Dominic Frick married Anna Barbara Wilhelmina Bischoff before 1917. Married Name Her married name was Kaiser. Grace Hinderman was the daughter of William F. Hinderman and Caroline Haas. Grace Hinderman married Norbert Kaiser.